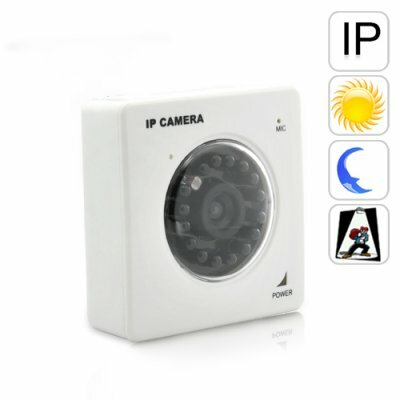 Successfully Added Mini IP Security Camera with Nightvision to your Shopping Cart. Introducing our smallest IP security camera to date, the I50. With the included software you can program the I50 to capture images whenever motion is detected. There are even sensitivity settings to increase or decrease the motion detection sensitivity as well as an option to select which areas of the picture frame can activate the motion detection. Even more amazing is the ability to notify you via email whenever motion is detected! Even first time users can get up and running in less than 5 minutes. Just follow these 3 easy steps. 1-Connect the I50 IP camera to Ethernet cable and Install the included software. 2- Open the software and type the displayed IP address in your IE web browser address bar. 3-Enter your password when prompted and view the live IP camera. That’s all there is to it. You can now access your live video stream from any computer with an active internet connection! The I50 uses the latest ARM 32bit RISC CPU together with a 1/4 image processor to capture great quality images. And since this device uses 16 powerful LEDs you can even capture all the action in total darkness. If you are looking for an IP camera that works flawlessly when you need it most, then the I50 is sure to satisfy. The I50 is could easily sell for much more. But thanks to our strong purchasing power we can now bring you the I50 at an unheard of factory direct low price. If you’re looking for an IP camera with great performance, advance functions and simplicity of use, then look no further than the I50. And don’t forget, this device comes with a full one year warranty and is in stock now and ready for express delivery. Order now while supplies last. - Video adjust - Brightness, Contrast, Saturation, Hue. - ASF Plug-in: Plug-in for MS Media Player v9.0. You might need this in order to playback the recorder video files created by the IP camera. We do not recommend flashing the firmware and cannot give you links or advice on changing the specifications of the product. Yes, you may find updated firmware and/or upgraded software on the internet for this IP Camera, but we cannot provide support or assistance in doing product modifications.